This is a guest post by the Rev. Josh Hale, pastor of Perritte Memorial United Methodist Church in Nacogdoches, Texas. You might know Josh from Twitter, where he is @expatminister. With the Elate Eight narrowed down now to the Faithful Four, let’s pause a moment and reflect on all of the kitsch which helped catapult (or hobble) these saints toward the Golden Halo. Clearly we can see that tacky souvenirs are not just a modern, capitalist byproduct of religion, but something which has been around for centuries—even millennia! So just how did we come by these knickknacks…and evaluate them as “tawdry”? My first year of ministry was spent amongst the Methodists of rural northeastern England, and they had established vibrant and enriching ecumenical partnerships with the Anglicans in their area. One of my colleagues’ villages was West Halton (North Lincolnshire) and its parish church dedicated to Saint Etheldreda, of whom I had never heard before. St. Etheldreda holding a church, possibly a souvenir model with a tempting sale price. Now Etheldreda (or Æthelthryth) was an East Anglian princess. As a Christian young lady, she took a vow of perpetual virginity, which caused a fair bit of strain as she kept getting married off to build political alliances. As I heard the story, Etheldreda was married to Egfrid, the King of Northumbria at the height of its power. He wanted children, she clearly did not…so she hoofed it. She made it across the boundary of the Humber River to freedom, and the spot where she prayed in celebration is where the West Halton parish church is now located. Great, you’re saying, but what does this have to do with those St. Margaret tote bags from last week? We’re getting there! After our friend Etheldreda celebrates her escape with two female companions, she goes further south to Ely (which was a gift from her first husband) and founded an abbey there, which later becomes the diocesan cathedral. She finally dies in 679 after a life of exemplary piety and impressive administrative gifts. But here’s what you need to know–another, more common, form of her name was Audrey. Pilgrims visiting her remains in Cambridgeshire, and later those who patronized the fair held in her name in Ely, often purchased local goods to remember her by, especially lacy clothing. These came over time to be considered low-quality or outdated goods, and among 17th century Puritans (who disdained frills and lace) they began to be sneered at by a corruption of her name: tawdry. So the next time you’re visiting the megachurch coffee shop or a cathedral bookstore, think about St. Etheldreda’s life of faith…and how she too is likely facepalming at the tawdry stuff Christians are willing to buy. 17 Comments to "Etheldreda’s tawdry souvenirs"
great article – we must keep a perspective! As ever, I’m amazed by the esoteric wisdom and other drek that Josh Hale has managed to accumulate in his skull mush. Love the guy! Plus, who doesn’t just love saying Nacogdoches? I’d totally order that in a restaurant with a margarita (if I hadn’t given up alcohol for Lent). Love the article and the content. There was nothing tawdry about either one. It can be tawdry…it can be bawdy….or maudlin,,you can sneer all you want whilst I peer at pure unadulterated TRASH !!! I love kitsch and it doesn’t have to be high-class. Remember it was Dolly Parton who said: “It takes a lot of money to look this cheap.” Well, I don’t have a loy of money, but I will spare a few ducats, especially for that Dietrich t-shirt and a couple of el cheapo dolls. I’m now going to see how MaryMags made out today. I love St. Audrey’s story–and Ely Cathedral is beautiful! But a parishioner looked up the Jerome/lion topsy turvy doll (perhaps looking for a birthday gift for her rector?) and discovered that is cost nearly a hundred bucks! It may be kitsch–but it ain’t cheap. Just sayin’. The transition from Etheldreda’s determination to remain in a virginal state into the commemoration of her by the purchase of cheap lacy garments made me really, really, really afraid I was about to be introduced to a line of saint-inspired lingerie. Will she be a competitor in next year’s Lent Madness ? 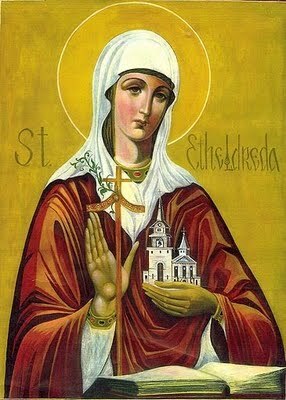 Late to the game, but…Etheldreda is one of my favorite Anglo-Saxon royal saints…right up there with her relative (I think) Saint Sexburga…there’s something to be said about royal princesses eschewing being used as bargaining chips in political alliances…all in all, Lent Madness has been fun, interesting, and provocative (in a good way)…thanks! What an excellent article. Thank you for posting. Those of us who have shopped at Marks & Spencer’s in Great Britain know that St. Michael is the patron saint of underwear.